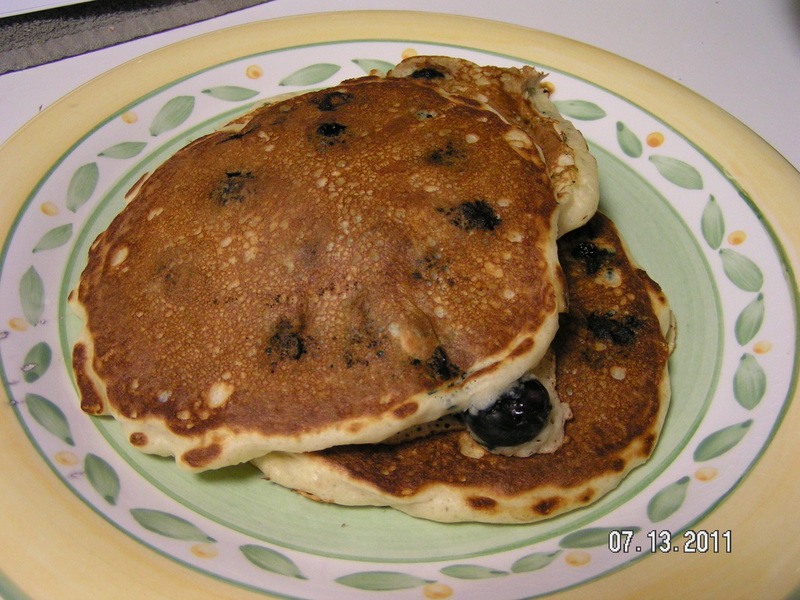 I awoke feeling ambitious this morning, so I grabbed a recipe for blueberry sour cream pancakes that I’ve been wanting to try. Recently, a friend of mine was sharing about her hubby’s fabulous pancakes or I’d never have thought to put sour cream in a pancake. My hubby, always a fan, exclaimed, “You know how to make pancakes?”. I just smiled sweetly. Luckily for him, right then I had a cup of hot coffee in one hand and a ladle in the other. Combine 1 cup flour, 1 cup milk, 1/2 cup sour cream, 1 large egg, 2 tbsp sugar, 2 tbsp melted butter, 2 tsp baking powder, 1 tsp baking soda, and a dash of salt. 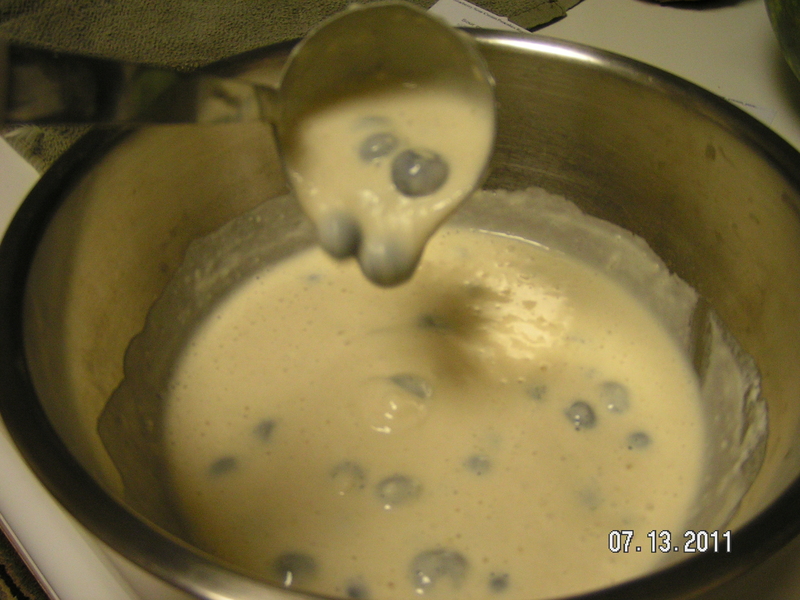 Stir until well mixed, then gently add 1 cup blueberries (or a whole pint if you love them like I do!). This is easily accomplished with a fork. Heat pan/griddle until drops of water will sizzle. 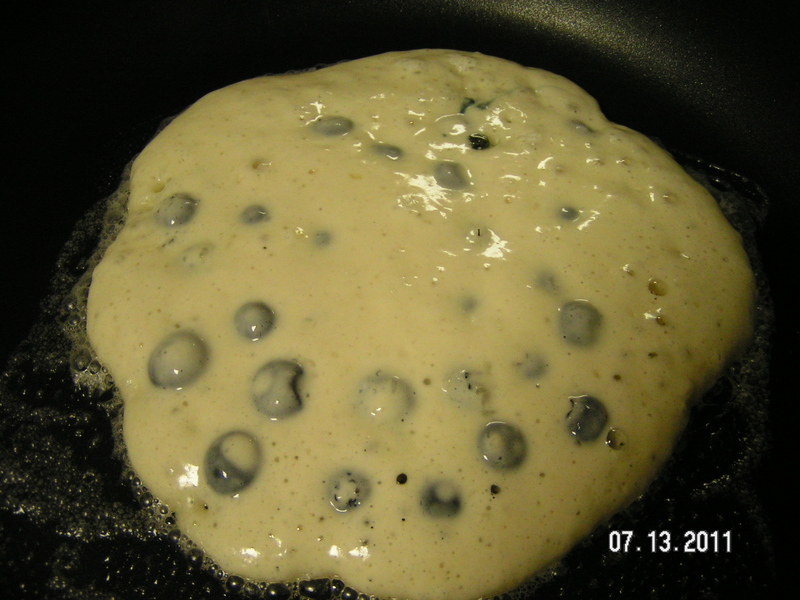 If not non-stick, you’ll want to grease lightly with butter (or spray) and drop about 1/4 cup of batter per pancake, wait until bubbles form in the top, and flip…should take about 2 to 3 minutes. Cook on side #2 about another 1 to 2 minutes, and serve with butter, syrup, whipped cream…whatever tickles your fancy! I suppose you could add blueberry compote too. 😛 MMMMMMMM…blueberries…. Actually, I like mine plain. With plenty of blueberries, of course! If you’re not a blueberry person, you can add to the batter 1/3 cup chopped pecans or 1/2 cup mashed banana and 1/2 cup chopped walnuts instead. Enjoy! Going to attempt this when you come to visit!!! I am trying these tomorrow morning (Sunday, 7/24). Due to gluten concerns with family members will try substituting the flour with Gluten Free Bisquick. Will let ya’ll know how they turn out.